We have many silver items in stock and ready to go, while we might need a few days to make more if we are out. Our gold pieces are made to order and require 1-2 weeks, while silver rings usually take one week. Some flexibility in delivery and scheduling may occur, if you have a time sensitive order, please feel free to enquire. Each piece can be ordered in Sterling Silver, 14K, 18K Yellow or White gold, and Platinum. If an item is not shown on the website in the metal or color you would like, please email for quotes. We probably haven't made that variation yet or remembered to take a photo before shipping. In regards to our white gold pieces, both in 14 and 18k, we do not plate our white gold with Rhodium. Even though plating for a chrome like finish is a standard practice in much of the jewelry industry, we feel the natural appearance of the gold is preferable. In addition, plating wears away within a couple of years, leaving off-color streaks and spots. Our pieces are natural, standard nickel white gold, which has a very white, slightly creamy color that becomes a softer creamy-golden tone in the 18K alloy. Unfortunately, I am unable to offer non-nickel palladium white at this time, I am very sorry about that but the labor required for this alloy is prohibitive. This jewelry is made from the highest quality silver available in the industry. In fact, we use a premium alloy that includes Germanium to resist tarnish and add strength. However, over these years of business it has become evident that about 7% of the public create an adverse reaction with Sterling Silver. It seems like certain skin chemistry is more acidic, causing sterling silver to tarnish or turn the finger green. This could be due to diet, genetic makeup, or contact with harsh detergents and chemicals. Most people experience no tarnish at all, others have varying amounts all the way up to actually corroding the metal into small pits. To help, some people have put a little clear nail polish on the inside of a ring, or there is a cream available to coat the piece, but requires daily repeated applications. Plating the silver may work temporarily but quickly wears off. There is honestly no true solution other than choosing to wear Gold or Platinum instead of silver. Please, be aware if you can wear silver before ordering silver jewelry. Since we have had to take losses from this issue several times, making jewelry and having it come back through no fault of our own, it eventually came to the point where we stopped accepting returns for this issue. However, to work out an equitable solution to the problem, for those who were unaware when ordering a silver ring, we have developed an upgrade policy, where we will credit the customer half the cost of their silver piece towards a white or yellow gold version of the same. A variety of chain lengths and styles can be selected on each of the product pages, when available for order with that particular pendant. I also offer our chains for order separately in the "Special Items" category Chains are a tough subject - to find a good chain regardless of price is very difficult and it is suprising how expensive they are. Our chains are some of the finest in the industry, made in Germany or Italy, solid gold or silver. They are not cheap. One safety feature - Each has a small unsoldered link at the clasp that will break away in an emergency. This link may be soldered optionally upon request. Hand engraving is available on items that offer it as an option on the website. If it is not offered, that means there is no space, unfortunately, as the design does not allow it. The engraving style is hand lettered using a small rotary tool, and can be seen in the photo below. Lettering is flexible and can be spaced large or small, so there are many options for engraving. If you have something special in mind, even a small symbol, please ask if we can accomodate it, usually we can! First of all, thank you for thinking of me for your custom jewelry, it is a compliment and an honor. However, we are a jewelry studio that issues a particular design as a final creation in a growing portfolio of unique artwork. This is in order to allow us personal time to design and create while still offering each previous popular design. Therefore we are unable to offer custom projects, other than what are shown or offered on our website. If you are looking for a ring in an individual fashion of your own, we recommend contacting a local, reputable crafting jeweler, preferably a Brother Mason, who will be better equipped and skilled for the task at hand. On our part, we will continue to offer new pieces of inventive design. If you would like to stay apprised of the latest offerings, please be sure to subscribe to our occasional newsletter in your website customer account settings. Past Master's Insignia - Square and Quadrant or Quadrant Only? There are three versions of Past Master's Insignia used throughout the US. The first and most common is the full Past Master's Jewel, with a Compass, Blazing Sun, and both a Square and Quadrant integrated together. The second version does not include the Square, but only the Compass, Sun, and Quadrant. (The Quadrant is often referred to in slang as a "rocker".) We have been compiling a list of each state that uses the "Quadrant Only" version, so far we have: Arizona, California, Hawaii, New Jersey, Nevada, New York, Kentucky, Florida, Georgia, and Wyoming. Every other state except Pennsylvannia uses the full Square and Quadrant version. The third Past Master's Jewel design, for The Grand Lodge of Pennsylvania, has a 47th Problem of Euclid incorporated underneath a hanging square. Unfortunately I do not have this design available at this time. I am not exactly sure which other states or regions might use the Quadrant Only version, so please ensure you are ordering the correct Past Master's insignia on your ring or jewel. We usually stock all silver pendants. Orders in stock usually take 1-3 days to ship, USPS usually takes 3-5 days to arrive. USPS is nice due to the Saturday shipping day and lower prices. UPS Second day shipping can be had by selecting the express shipping option. "Made to order" items such as most rings, and all gold and platinum pieces, are paid in advance and usually take 1-2 weeks.We would accept order and payment, and then keep you apprised of our progress throughout the making of your jewelry. If you would prefer not to pay in advance, a 50% deposit can be arranged, and lay away or installment payment options are also welcome as described below. When ordering, we offer the option of a "plastic ring sizer" being mailed ASAP. These are small zip ties with the ring size marked on it and they work great. We've had excellent results with this system. We have noticed our rings fit best when snug, as they are heavier than most, but be sure it fits comfortably over the knuckle. We guarantee your ring will be the size ordered, please ensure you are ordering the correct size, by using our ring sizer or by visiting a local jeweler to get sized. About resizing...We do not recommend resizing a ring, as it often involves stretching, or cutting open your ring, and then resealing it with solder. This may often require removal of the gemstone. Unfortunately, it is sometimes unavoidable if we lose or gain weight. We are able to resize your ring here in our studio in about a week. Our resizing service is available to order in the "special items" section of the website. After ordering, mail your ring to the studio and we will send it right back, shipping included at the time of purchase of the ring sizing service. We believe in careful management of our natural resources, and protecting the glorious work of the GAOTU. In that spirit, we have worked hard to eliminate the damage of casting precious metal alloys and polishing jewelry. Making jewelry consumes a fair bit of electricity, chemicals and materials. To mitigate this, we use air filters on our polishers, kiln and metal melting furnace, have switched to using phosphate-free, environmentally safe detergents in our ultrasonic cleaners, biodegradable packaging and UPS carbon neutral shipping. We also use certified environmentally viable precious metals, low chemical gypsum investment, non-toxic polishes and we neutralize our acids before disposal. More than half the electricity we use comes from renewable sources such as hydro electric, solar, wind, and nuclear that creates no greenhouse gases. We will continue to search for new ways to reduce our environmental footprint as the years progress. Hopefully this will give an idea of the scale of our pendants. 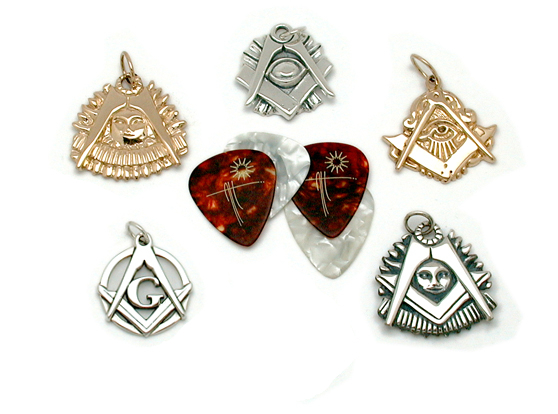 The photo above should appear close to actual size, and shows a selection of our pendants compared with standard medium weight guitar picks. The Man Who Would be King and Original Mason's Jewel are 1 1/8" wide and tall, and weigh about 15 grams. 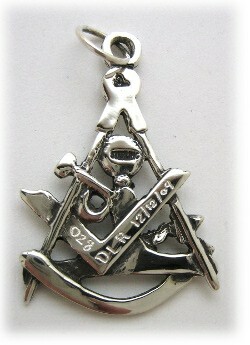 The Past Master's Jewel is one of our largest pieces and weighs 22 grams in 14k Gold. Our Phone has been disconnected pending our relocation. Currently 47 guest(s) and 0 member(s) online.